What has 4 legs, a great set of antlers and bugles? Who: Families. Bring all kids able to be quiet & respectful of the elk. 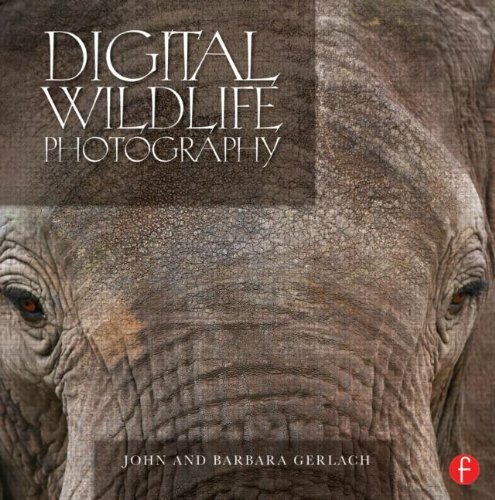 Wildlife photographers! What: The annual elk rut. How: Billings /Logan Airport. Drive to Malta (3 hr through sky country) Enjoy! If you have never heard this amazing sound or watched these huge magnificent animals during their yearly rut, bugling their way into the hearts of their ladies, you are missing one of the great wildlife experiences in North America. For 11 months of the year female elk with their young live together, separate from the males. They give birth, raise their calves, dodge predators, and stick together quite contentedly in their cow-calf herds – until September. Suddenly, as the leaves begin to turn, the urge for romance over takes those separated bulls, driving them to find the female herds. So zealous are they to find the ladies and gather a personal harem that sound bursts from their throats in a loud bugle. By this time their antlers, shed in February or March, are back in full-grown glory. In other words: When these elk announce their presence they are: Loud and Proud! The calls waft through the forest, swirl around the trees, across the open clearings, and hang on the autumn air. The females react, drawn in by the sound. Around dusk they start moving out from the tree line into the viewing area along the road. The males sense their arrival and get more and more excited. The bugling reaches fever pitch right before their arrival. That’s when the action really begins. Love, Jealousy and Competition - Ungulate style! The males try to herd as many if the females as possible into their own private harems. As always in matters of love, jealousy and competition abound. The sound of bugling fills the air, rival males rush and feint and clash those magnificent antlers; while the females wait patiently on the sidelines for the victors. It is pure romantic drama – ungulate style - and well worth traveling for. The perfect place to witness the elk rut - and hear the concert - is Slippery Ann Elk Viewing Area at the Charles M. Russell National Wildlife Refuge in Montana’s Missouri River Country. Starting in September upwards of 500 Rocky Mountain elk (or “Wapiti”, as the Shawnee people call them) gather here only to disappear again in early October. Elk numbers peak between the second and third weeks of September, and so do the elk watchers. The locals come early to stake out the best viewing spots, setting up chairs and even bringing drinks and picnics – so should you. THE ELK SEEM TO UNDERSTAND THAT SLIPPERY ANN IS A NO HUNT ZONE. THEY HAVE NO PROBLEM WITH FOLKS COMING TO WITNESS THEIR MATING RITUALS. IMAGE: COURTESY OF ©MONTANA'S MISSOURI RIVER COUNTRY. What Makes Slippery Ann Great ? 1. Amazing Sky: You will never forget the endless blue sky punctuated by clouds whose character and mood foretell the future. 2. Amazing Country: As vast as a city (or town) dweller can possibly imagine and then some. Prepared to be amazed. 3. The Family: Yours. Step away from virtual world into an old/new place that will relax, refresh, and awaken your imagination simultaneously. This is the perfect place for a multi-generational family vacation. 4. Witness the Elk with Friends: Elk watching is a community affair and this community is friendly, direct, low-key, and welcoming. You’ll might just find yourself sharing the excitement at Slippery Ann with the folks who grew the food you had for breakfast and the ones who provided the bed you slept in. 5. The Elk. Their sound and the whole rut itself are simply amazing. Did We Mention Slippery Ann is Beautiful? Even people born in the US are amazed at how vast the country is. 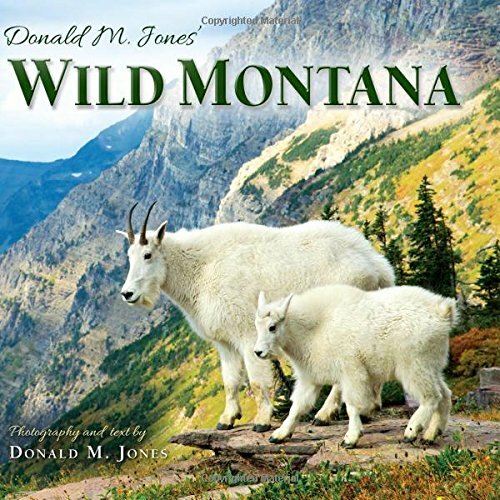 Montana is one of those wide-open places and the Missouri River Country can easily be categorized as “off the beaten track.” That means two things: 1) Yes, it will take a little extra planning to get there, but 2) You will be heading toward a part of the US that is unmatched for its unique wildlife, nature, and history. This is where the story of Native Americans, cowboys, gold rushers, homesteaders, outlaws and dreamers all come together This is where prairie and mountains meet. The Charles M. Russell National Wildlife Refuge sprawls across the north/east part of the state following the Missouri River as it flows west to east across the state for about 125 miles (200 km.) as the crow flies. It is part of the larger Charles M. Russell complex and consists of native grassland, badlands, prairie, forest, and even riparian wetlands. LOOKING OVER THE MISSOURI RIVER FROM A HIGH POINT NEAR SLIPPERY ANN AT THE CHARLES M. RUSSELL NATIONAL WILDLIFE REFUGE. IMAGE: COURTESY OF ©MONTANA'S MISSOURI RIVER COUNTRY. MANY PEOPLE STILL BELIEVE THERE IS GOLD IN THOSE HILLS. WANT TO TRY YOUR LUCK? THE OLD MINES ARE CLOSED BUT ZORTMAN OFFERS GOLD PANNING LESSONS. IMAGE: COURTESY OF ©MONTANA'S MISSOURI RIVER COUNTRY. 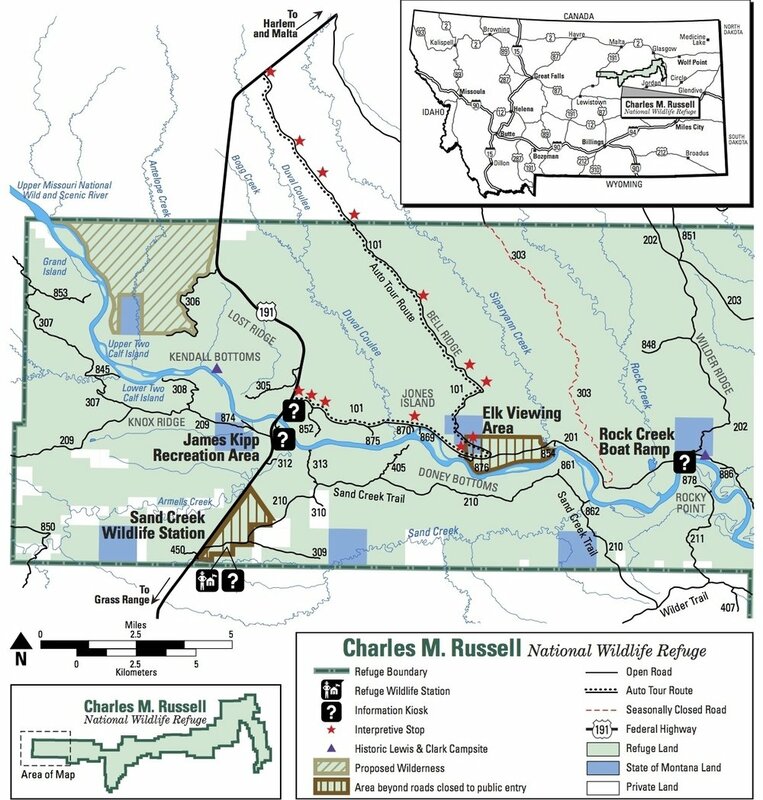 The Charles M. Russell National Wildlife Refuge, named for the western artist and conservationist, runs length-wise across the north-eastern part of Montana following the Missouri river. Slippery Ann Elk Viewing Area is located on the western half of the refuge in Phillips County. It is easily accessed from the turnoff on Highway 191 (accessible from Interstate 95) just north of the Fred Robinson Bridge over the Missouri River. Although licensed, seasonal bow hunting is allowed elsewhere in the refuge, at Slippery Ann it is not. The elk seem to know this and they are very relaxed. Even having folks lined up to witness their business does not bother them - as long as the responsible elk viewing guidelines are followed (see below). SURE FOOTED WILD BIG HORN SHEEP ARE NATIVE TO NORTH AMERICA. THEIR DISTINCTIVE THICK CURVING HORNS CAN WIEGH UP TO 30 POUNDS (14 KG.) 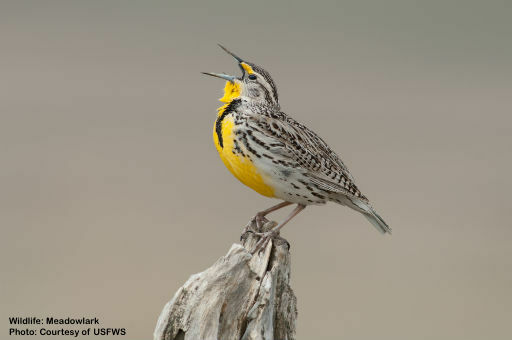 IMAGE FROM USFWS CHARLES M. RUSSELL NATIONAL WILDLIFE REFUGE. RE-INTRODUCED IN 1994, THE ENDANGERED BLACK FOOTED FERRET HAS YET TO ESTABLISH A SELF-SUSTAINING COLONY IN MONTANA, BUT THERE IS STILL HOPE. IMAGE: COURTESY OF USFWS. 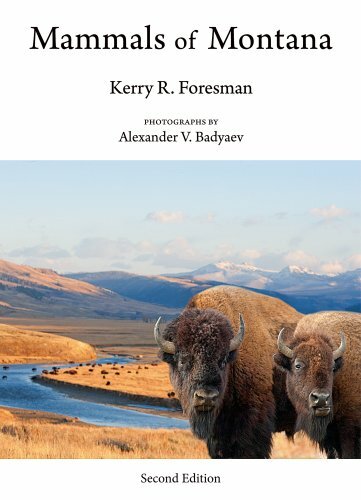 Look for mountain lion (cougar), bob cat, Rocky Mountain big horn sheep, pronghorn, mule, and white tailed deer, and red and swift fox, beaver, mink, and river otter ,plus 40 catalogued species of butterflies. Endangered black-footed ferret, reintroduced into Montana in 1994, has still not been able to establish self-sustaining colonies, but there is hope, look for them in prairie dog colonies, the ferrets live in their tunnel systems. Over 250 species of birds either pass through or make their homes here during any given year. This is a Global Important Bird Area with, ” … significant members of globally threatened species …”. The Bowdoin National Wildlife Refuge is a short drive (14miles / 22.5 km) from Malta and well worth a day's trip for hike and some bird watching. In the autumn tundra swans arrive to feed and fatten up on the sago pondweed before they head out east for the winter. Among the mammals here you may even see a pronghorn antelope. The Shawnee name for the elk, “Wapiti”, means white rump, and these elk do have a light colored tail end on their buff colored 250+ pound (113 kg) bodies. They also have thinner more elegant antlers than their more western living Roosevelt elk cousins. Elk are quite relaxed around folks who are not hunting them – but will quickly leave (they run up to 35 mph / 56 kph) if bothered. See below for the U.S. Fish and Wildlife Service’s viewing guide for a great elk bugling experience. BULL ELK USE BUGLING PLUS THEIR FULLY MATURED ANTLERS TO IMPRESS FEMALES AND INTIMIDATE RIVALS. WHEN THAT IS NOT ENOUGH THE SPARRING AND FIGHTING CAN BECOME INTENSE - THE LADIES REMAIN CALM. IMAGE: COURTESY OF ©MONTANA'S MISSOURI RIVER COUNTRY. Viewing Area Boundaries: The boundary of the Elk Viewing Area is clearly posted from the Slippery Ann Campground to Slippery Ann Creek, on both sides of Route #201. The area beyond the road in the Elk Viewing Area is closed to public entry. Please remain at road's edge while you enjoy watching the elk. Respect & Do Not Disturb the Animals: Use binoculars, spotting scopes or telephoto camera lenses to "get closer". Being too close or disturbing animals can be very stressful to wildlife and unsafe for you. Do Not Disturb Other Viewers: Keep conversations low and to minimum. 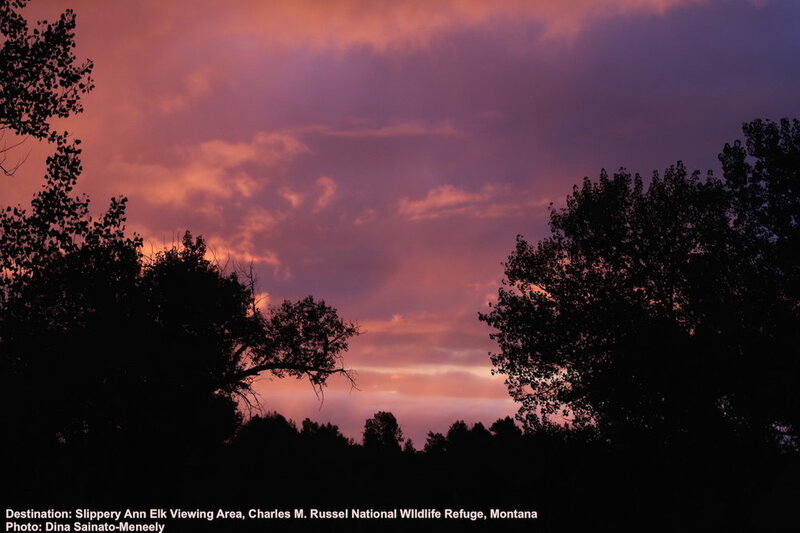 No Artificial Light: The use of artificial light to locate wildlife, including elk, is prohibited at all times on Charles M. Russell NWR. This includes the use of spotlights, flashlights, and your vehicle headlights. Collect Only Photos & Memories: The collection of shed antlers and animal skulls is illegal. These items are an important source of calcium for elk, deer and other wildlife on the refuge. Remove Food Scraps & Trash: Be careful of trash and food. Do not leave scraps “for the animals.” Not only is it unhealthy in some cases for the animals, it actually can shorten their lives. When a wild animal associated food with humans its behavior around then changes. That can evolve into a dangerous situation for both. The nearest town to Slippery Ann is Zortman followed by larger Malta, the county seat. 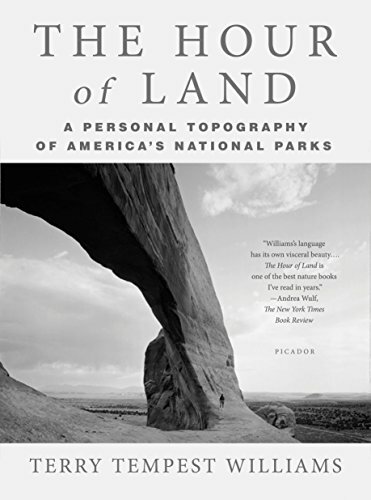 This is storied land of native peoples, cowboys, bandits and train robbers, mining booms-and-busts, and folks that know the value of good neighbors and friends –which is how you are treated soon as you arrive. SETTING SUN CREATES A SILHOUETTE OF MALTA'S DOWNTOWN. IMAGE: COURTESY OF THE MALTA CHAMBER OF COMMERCE AND MONTANA'S MISSOURI RIVER COUNTRY. “base-camp” for exploring the area. Steeped in history, Malta’s early residents were folks looking for a new start, care of Abraham Lincoln’s 1862 Homestead Act. It offered them 160 acres and five years of hard work to build a new life. And they did. CHASING COWS. A RANCH AND OPEN SKY OUTSIDE OF MALTA, PHILLIPS COUNTY, MONTANA. IMAGE: COURTESY OF ©VIVIEN BRUCKNER, PRAIRIE LIFE PHOTOGRAPHY & PHILLCO ECONOMIC GROWTH COUNCIL. This part of the U.S. is not only famous for its present wildlife – it is also world renowned for some of the richest dinosaur fossil fields on the planet! Malta, a town of only 2,000 people doesn’t just have one museum dedicated to the area’s prehistoric residents– it has two! Don’t miss Malta’s Great Plains Dinosaur Museum, home of Leonardo, a duck-billed dino famous for being the best-preserved dinosaur ever recorded. Then stop into The Phillips County Museum, for exhibits about our native Americans, early pioneer life, cowboys and bandits, and of course – dinosaurs! 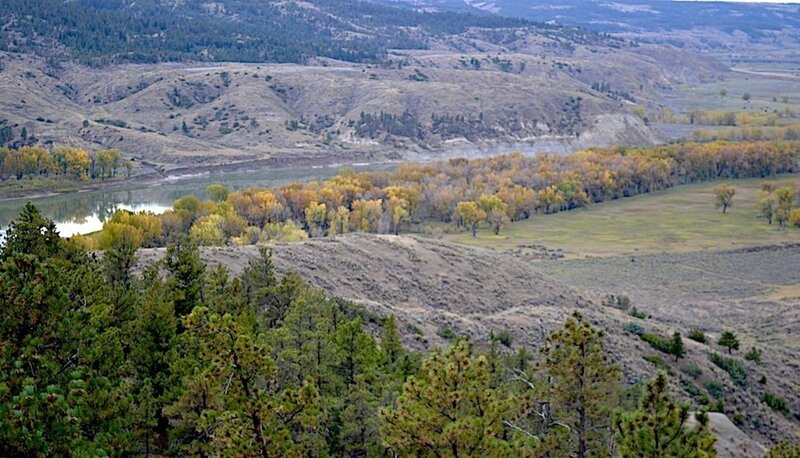 SOME OF THE WORLD'S MOST IMPORTANT DINOSAUR DISCOVERIES HAVE BEEN IN THIS PART OF MONTANA. MALTA HAS TWO MUSEUMS DEDICATED TO THE AREA'S PREHISTORIC WILDLIFE INCLUDING THE PHILLIPS COUNTY MUSEUM. IMAGE COURTESY OF MONTANA'S MISSOURI RIVER COUNTRY. There are no strangers in Malta – and no big boxes here either. Business is a family affair. Every cent you spend goes into the local economy. Take a little time and explore the town. Malta has a variety of restaurants to sample good western style home cooking. After your meal, explore the downtown shops featuring local crafts and jewelry. Raining? Try a movie in the kind of theater that brought Hollywood to millions to before the advent of cable channels or the slick multiplex, and don’t miss great local live music performed through-out the year in different restaurant and bars in town. The Malta Chamber of Commerce has put together wonderful suggested afternoon and/ or full day sample itineraries – culminating with a dip in the natural Sleeping Buffalo Hot Springs pool about a fifteen-minute drive out of town. FIELD OF WHEAT AND SUNFLOWERS, NEAR MALTA, PHILLIPS COUNTY, MONTANA. IMAGE: COURTESY OF MONTANA'S MISSOURI RIVER COUNTRY AND THE PHILLCO ECONOMIC GROWTH COUNCIL. The Great Northern Hotel Originally built in 1904, The Great Northern Hotel bills itself as Malta’s only “full-service” hotel and indeed it offers antique filled, cozy rooms and room service, Wi-Fi, a steak house restaurant, coffee shop, and a bar / lounge on the premises. The Royals Hotel: centrally located, newly renovated, the Royals can accommodate families. Sport hunting is part of the history and culture in this part of the country. Most game is butchered and consumed. These hotels cater to hunters. Be respectiful. The Country Inn 406-545-2198 Just south of Malta on the Marion Hills Golf Course. Pet friendly. Most offer Wi-Fi, a refrigerator, microwave, and coffee maker in each room, but check to be sure. They all include a friendly welcome and warm hospitality. HAVE NO DOUBT, CARMEL IS ALWAYS ON DUTY TO MAKE SURE THAT ZORTMAN LIVES UP TO ITS BOAST AS "THE FRIENDLIEST LITTLE TOWN IN MONTANA." IMAGE: COURTESY OF MONTANA'S MISSOURI RIVER COUNTRY. No visit to the area would be complete without a visit to Zortman, about 25 miles from Slippery Ann. This one-time goldmine boomtown is short on population but long on history and heart. Many of the folks from Phillips County and beyond spend a night in Zortman when they come for the elk. ZORTMAN'S BUCKHORN STORE & CABINS HAS EVERYTHING FROM FRESH VEGGIES TO FUEL. SAY "HI" TO OWNER ROD, FOR US! IMAGE: COURTESY OF ©ROD BOLAND. Looking for a good meal? Try the Miners Club Restaurant for their famous Denver omelet or chicken fried steak – then step over to the bar side of the establishment and enjoy conversation and a cold one with the neighbors. ROD'S SEVEN LOG CABINS ARE PERFECT FOR A FAMILY VISIT, MOST WILL ACCOMMODATE 2-6 PEOPLE BUT ONE WILL SLEEP A SMALL ARMY. SOUL FILLING VIEWS OF THE MOUNTAINS AND SKY INCLUDED FREE OF CHARGE. BEWARE - YOU MAY NEVER WANT TO LEAVE. IMAGE: COURTESY OF ©ROD BOLAND. Book early! There are only 7 cabins available and the locals stay here when they come to Slippery Ann. The fully modernized and equipped log cabins were built around 1930. Four of them have complete kitchens, and two have microwaves and coffee makers. These 6 can accommodate 4-6 people each. The 7th cabin is newer, built about 15 years ago. It is over 1200 sq. ft. (111.5 sq. m) and has a full kitchen, living room, dining room and all amenities. The best part? The air, the sky, the mountains, and Rod, he takes good care of you! Bring the family! ONCE A GOLD-RUSH TOWN, MANY STILL BELIEVE THERE IS GOLD TO BE FOUND IN THE MOUNTAINS AND STREAMS AROUND ZORTMAN. ARE YOU A BELIEVER? IMAGE: COURTESY OF MONTANA'S MISSOURI RIVER COUNTRY. Situated near the Fred Robinson Bridge on Highway 191 South of Malta, the James Kipp Recreational Area is near-by to the Missouri River and very close to Slippery Ann. Of its 34 campsites, 19 are considered single units and 15 are multi-group campsites. Each campsite has a concrete picnic table and fire ring, and all are accessible. Eight vault toilets are located throughout the campground. There are on-duty campground hosts. Check the web site for a list of additional amenities. The nearest fly-in to Slippery Ann is the Billings-Logan airport. There is connection from major U.S cities with Alaska Air, Delta, or United. Cape Air and Allegiant also have flights into Billings. It is a little over 3 hours drive from Billings Logan Airport to Malta via US 87 to US 191 . Rent a car and enjoy the scenery. The roads inside the refuge are gravel not pavement, so a four-wheel drive vehicle would be optimal. 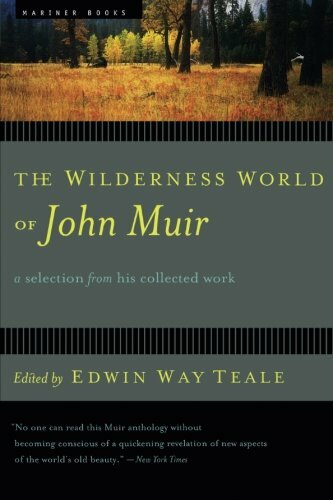 Prepare to be amazed at the scope and beauty of the country. DON'T MISS THE OPPORTUNITY TO WITNESS THE ROCKY MOUNTAIN ELK BUGLING AND RUT AT THE SLIPPERY ANN ELK VIEWING AREA AT CHARLES M. RUSSELL NATONAL WILDLIFE REFUGE IN MONTANA'S MISSOURI RIVER COUNTRY. IMAGE: COURTESY OF ©MONTANA'S MISSOURI RIVER COUNTRY. How to Photograph the Soul of the Forest. 7 Days Photographing the Most Magnificent National Parks in America.